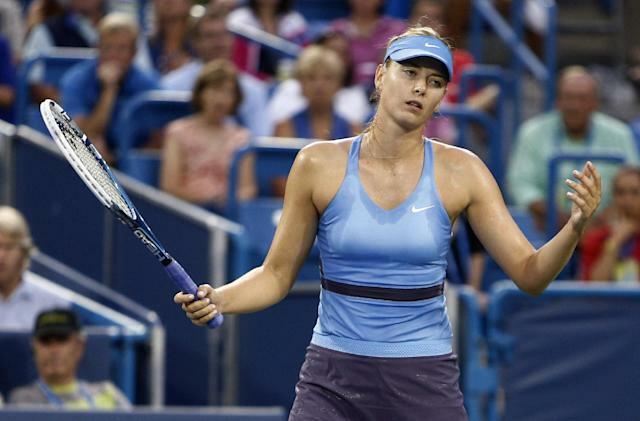 The semi-final match between WTA Tour marquee players Maria Sharapova and Ana Ivanovic in Cincinnati Saturday night might not have featured the best tennis in the game's history – although it had its moments – but it wasn't short on drama. Ivanovic led by a set and 4-0, then 5-2 before Sharapova mounted a comeback to lead 4-2 in the third set and have match points at 5-4. Ivanovic ended up winning it 6-2, 5-7, 7-5 in two hours and 45 minutes. But the moment that had social media in an uproar came in the second game of the final set when Ivanovic doubled over, apparently in some distress and in tears, and ended up lying on the court as the tournament physician took her blood pressure. Sharapova was clearly not impressed; earlier, she also had been unimpressed at Ivanovic leaving the court, asking the chair umpire whether she was merely taking a bathroom break or doing a full wardrobe change. In short, she was not impressed, and perhaps even less impressed with the way she was playing to put herself in such a deep hole. But she let out a little "bad Maria" after she double-faulted to hand that third-set break back to her opponent. It appeared the remark was directed at chair umpire Felix Torralba. Afterwards, Sharapova said she "never got a clear answer" on what the medical issue was, speculated it might be "anxiety" but that Ivanovic seemed fine afterwards during a long, gruelling point that followed. She deflected a question about the above gesture saying Ivanovic's distress was "strange timing" and just "came out of nowhere," Dr. Sharapova again mentioning she couldn't come up with another possible reason for it other than anxiety. This, of course, came after the Russian lost a match she appeared on her way to win. Certainly her comments about the lack of information – whether or not there would be a medical timeout – had some validity. If there were, Sharapova would have been allowed to have coach Sven Groeneveld come on court during the treatment. Ivanovic has had the occasional on-court medical incident in the past. One that comes to mind came at Indian Wells in 2012 during a match against Ksenia Pervak. Ivanovic landed after a serve, and doubled over, saying later she felt dizzy and that she thought "it was just a little bit of excitement and everything." 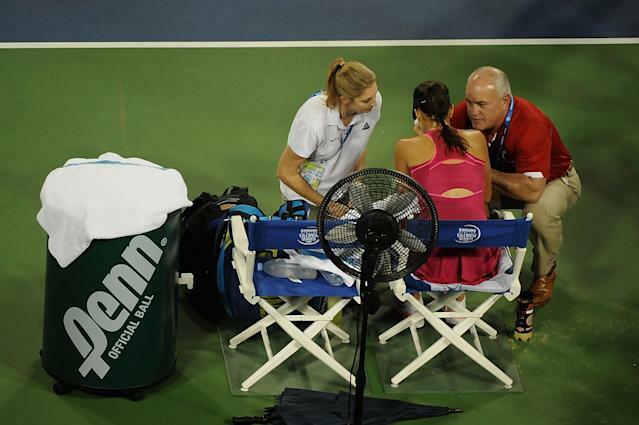 She sat down for quite awhile in the middle of the match, as she and the trainer waited for the doctor. "Yeah, I just said after I landed after that serve I just felt so dizzy. And then they wanted to track my blood pressure. I was like, I'm fine, I'm fine. I didn't want to cause any pause," she said. Ironically, Ivanovic ended up retiring in her match against a concerned-looking Sharapova in the semis of that tournament, after having a medical timeout to treat a hip injury. In Cincinnati, while they took her blood pressure, Ivanovic thought it might have been something she ate. “I think I ate something bad today. When my coach was coming out, I kept telling him I don’t feel good, like my stomach is really upset. Then it really built up in the third set, and I was not feeling fine. They gave me some pills, and after some games it was better," Ivanovic told the media in Cincinnati afterwards. It wasn't Sharapova's finest hour. But sometimes it's fascinating to take a look behind curtain of the composed, controlled exterior. Ivanovic plays Serena Williams in the Cincinnati final today.